It is with great sadness that after 32 years, Rannoch Smokery will close as of 18th January 2019. Trading has been difficult for a number of years, during which time we have subsidised the business to ensure employment in Rannoch. However, in the current economic climate with increasing supplier costs and decreasing revenue streams, we have no alternative but to cease trading. Rannoch Smokery produces some of Scotland’s finest gourmet meats and is recognised through the Great Taste Awards, the Guild of Fine Food, Scotland Food & Drink Federation and Scotland Food and Drink to name only a few. 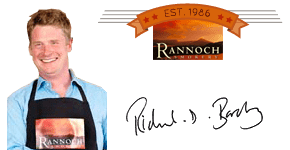 Rannoch Smokery has built an outstanding reputation as a dedicated meat and game smoker passionate about quality and producing the best smoked meats from the hills surrounding Kinloch Rannoch in Scotland. Situated at the heart of the Scottish Highlands in the shadow of Schiehallion, Rannoch Smokery offers its customers a true flavour of Scotland, as most of the products are sourced locally including the red deer from the surrounding hills for its flagship Smoked Venison, along with beef from Aberdeenshire. Richard Barclay took over the family business from his father, Leo Barclay, who started the company in the 1980’s. Following bad winter which prevented him getting his deer cull to market, Leo brined the meat in the bath tub before slowly smoking it in a home-made smoker, creating the first Rannoch Smoked Venison, which is still one of the company’s best sellers nationwide. Now, the smoked venison is only one of an assortment of meats carefully prepared to deliver nothing but the best in quality and flavour. All products carry that top quality brand through retail distributers and food service outlets far and wide. 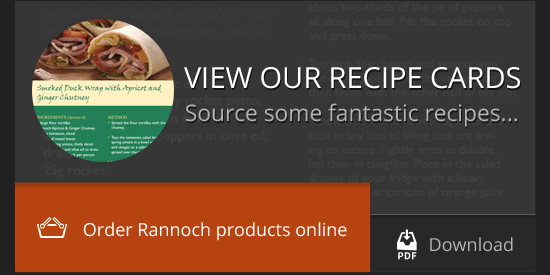 "If you're looking for Scottish, local, flavoursome quality produce and value for money, Rannoch Smokery products tick all the right boxes."